CD45 is a receptor linked protein tyrosine phosphatase present in all cells of the hematopoietic lineage except erythrocytes and plasma cells. Originally known as common leukocyte antigen or protein tyrosine phosphatase receptor type C it was given the designation CD45 by the HCDM. CD45 is highly conserved across mammals as well as having homologs in several more ancient species. Its expression is strong among all hematopoietic cells particularly T cells when it can make up to 10% of the proteins on the surface of cells (Williams and Barclay 1986). 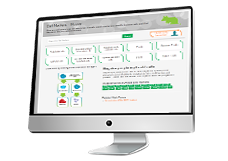 Our full range of CD45 products can be found here. CD45 is a type I transmembrane consisting of two intracellular phosphatase domains, a transmembrane domain and an extracellular domain. The intracellular domain consists of two domains, only one of which has intrinsic kinase activity. However both are required for appropriate phosphate activity (Desai et al. 1994). The extracellular domain contains three membrane proximal fibronectin type II repeats, a cysteine rich region and the variable N-terminal region. The extracellular domain of human CD45 varies in length (391 to 552 amino acids) depending on which combinations of exons are alternatively used to form the CD45 mRNA (see figure 1) (Streuli et al. 1987). The N-terminal region is heavily glycosylated and contains a number of domains dependent on alternative splicing of exons 4, 5, 6 and possibly 7 of the CD45 gene. For identification purposes the resulting proteins have suffixes consisting of letters describing the individual exons present. Letter A indicates exon 4 is present, letter B exon 5 and letter C exon 6. The cytoplasmic domains of CD45 have intrinsic phosphatase activity. In T cells, CD45 dephosphorylates the tyrosine kinase Lck a residue Y505, as part of TCR activation signaling cascade. Ultimately this leads to increased cytokine production and proliferation of T cells. 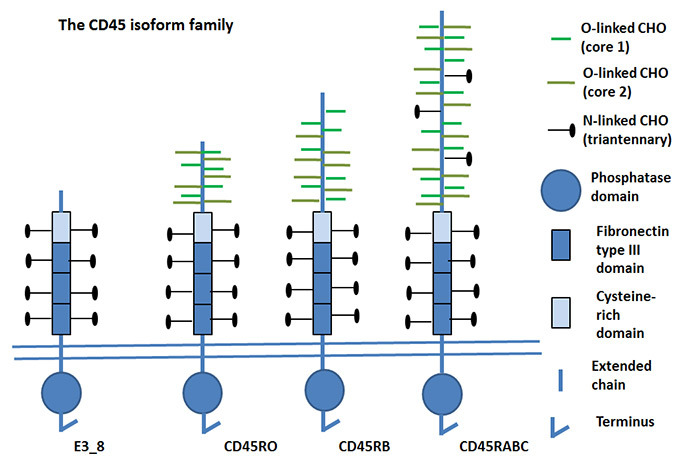 Six different human isoforms of CD45 mRNAs have been isolated, which contain all three exons (ABC isoform), two of the three exons (AB and BC isoform), only one exon (A isoform and B isoform), or no exons (O isoform) (Hermiston et al. 2003). All of the isoforms have the same eight amino acids at their amino-terminus, which are followed by the various combinations of A, B, and C peptides (66, 47, and 48 amino acids long, respectively). The remaining regions (the 383-amino-acid extracellular region, the 22-aminoacid transmembrane peptide, and the 707 aminoacid-cytoplasmic region) have the identical sequences in all isoforms. As a result of the variability of the N-terminal region of CD45, antibodies raised against the CD45 protein recognize either all of the CD45 isoforms or only a subset of them (CD45R). 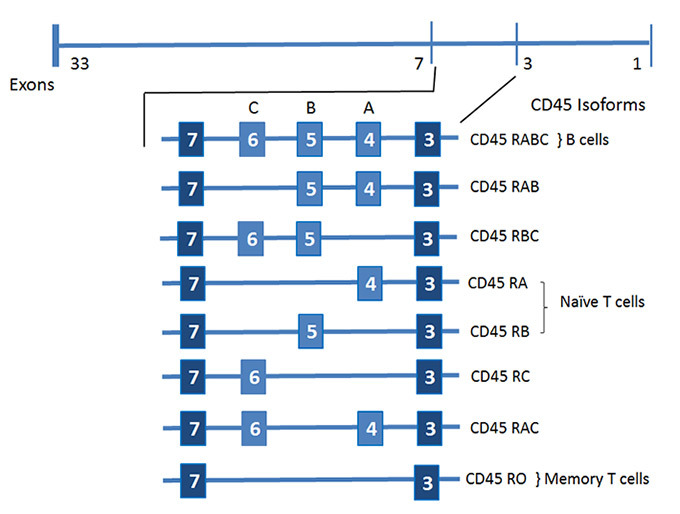 The suffix RA, RB, or RO indicates the requirement of the amino acid residues corresponding to exon A (RA), exon B (RB), or a lack of amino acid residues corresponding to exon A, B and C (RO) for the CD45 epitope expression, respectively (see figure 2 and table 1). Adapted from Holmes N 2006.
mRNA lacking all four exons has been detected and its corresponding protein, e3_8, has been observed in mouse thymocytes and splenocytes (Holmes 2006). e3_8 lacks all exons and therefore most of the variable N-Terminal region. The functional significance of this smallest isoform remains to be determined. There are two identifiable alleles of CD45 in mice: CD45.1 (Ly5.1 historically) and CD45.2 (Ly5.2 historically). Although there are a large number of permutations possible, only six isoforms are traditionally identified in humans. The isoforms are RA, RO, RB, RAB, RBC and RABC (Hermiston et al. 2003). CD45RA contains exon 4 but lacks exon 5 and 6. It's expressed on naïve T cells. CD45RO contains exon 3, 7 and 8 and lacks the RA, RB and RC exons of the CD45 gene. CD45 isoforms with short extracellular domains homodimerize more easily than those with large extracellular domains. The CD45RO isoform is expressed on activated and memory T cells, some B cell subsets, activated monocytes/macrophages, and granulocytes. CD45RO enhances both T cell receptor and B cell receptor signaling mediated activation. CD45RB contains only one of the three alternatively spliced exons (exon 5). CD45RB is an isoform of CD45 with exon 5 splicing (encodes B determinant). It is a 220 kD glycoprotein expressed on peripheral B cells, naïve T cells, thymocytes, weakly on macrophages, and dendritic cells. It plays a critical role in T cell receptor and B cell receptor signaling. As T cells become activated and progress from naïve to memory cells, CD45RB expression is downregulated. Additionally, functionally distinct CD4+ T cell subsets, which secrete differing cytokine profiles, can be separated by CD45RB intensity. CD45RAB contains exon 4 and 5 of the CD45 gene. CD45RABC contains all three possible exons (exon 4, 5 and 6). Desai DM et al. (1994). The catalytic activity of the CD45 membrane-proximal phosphatase domain is required for TCR signaling and regulation. EMBO J. 13, 4002–4010. Hermiston ML et al. (2003). CD45: a critical regulator of signaling thresholds in immune cells. Annu Rev Immunol. 21, 107-137. Holmes N (2006) CD45: all is not yet crystal clear. Immunology. 117, 145-155. Streuli M et al. (1987). Differential usage of three exons generates at least five different mRNAs encoding human leukocyte common antigens. J. Exp. Med. 166, 1548–1566. Williams AF and Barclay AN (1986). Glycoprotein antigens of the lymphocyte surface and their purification by antibody affinity chromatography. In Handbook of Experimental Immunology, Weir DM and Herzenberg LA ed. (Blackwell Scientific Publications; Oxford, UK). pp. 1–24.